system of defense structures for protection from enemy attacks. Fortification developed along two general lines: permanent sites built in peacetime, and emplacements and obstacles hastily constructed in the field in time of war. small, low fortification that houses machine guns and antitank weapons. Similar to a blockhouse, it is usually made of concrete, steel, logs, or filled sandbags. Pillboxes came into use during the early 20th cent. a defensive structure adapted for all-around machine gun, and sometimes artillery, fire. A blockhouse may be made of wood, stone, concrete, or steel, sometimes with armor, and has living quarters for a garrison. Blockhouses were widely used in the Anglo-Boer War of 1899–1902 and in World Wars I and II, especially to cover railroad bridges, for defense of cities, in forested swamp areas, on mountain passes, and in systems of permanent fortification. A reinforced concrete structure, often built underground or half-underground, and sometimes dome-shaped, to provide protection against blast, heat, or explosion during rocket launchings or related activities, and usually housing electronic equipment used in launching the rocket. The activity that goes on in such a structure. 1. 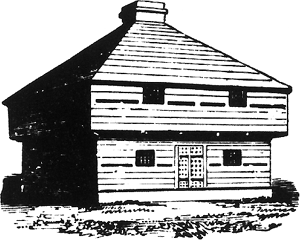 A fortified structure used to furnish protection against enemy attack in frontier areas, usually at a location of strategic importance; often square or polygonal in plan; typically constructed of hewn timbers having dovetailed notches at the corners to provide strong rigid joints; commonly, an overhanging upper story; often masonry walls on the ground story with log construction above, or entirely of log construction; frequently, a pyramidal roof; usually a few small windows with heavy shutters; loophole openings through the walls permit the firing of guns over a wide range of angles. 2. A reinforced concrete structure that provides shelter against the hazards of heat, blast, or nuclear radiation. In a re-examination of the William Richardson material at the University of Toronto Libraries, an unexpected discovery was a sketch of the British palisaded blockhouse known as York Fort, drawn by Richardson during a voyage to Labrador in 1769. When an advance was checked by intense machine–gun fire from concrete blockhouses and by snipers, William, 25, of Motherwell, dashed forward with two men to rush the largest blockhouse. Andrews Blockhouse National Historic Site of Canada. the Nazi gliders reached the air above Eben Emael and then, almost as one, the teams dived sharply to avoid antiaircraft fire, landing within close range of the domes and blockhouses protecting the guns. They'd left behind all kinds of construction debris after they finished the blockhouses, and since they'd started to save energy by turning the lights off every night, I'd noticed a lot of one-eyed dogs in our beautiful hometown. Towards the end of the conventional phase of the conflict and through the period of transition to irregular warfare, the volunteer forces were posted to isolated blockhouses and ordered to protect communication lines and guard prisoners. Most folks call them Cell-phone towers but in fact any rational person understands that even primary cell transmitters require no more power than your apartment or house does, so the bundle of massive cables that run from the fortified blockhouses to the towers death energy producing panels, rods, drums and dishes should be suspect. As France relocated its nuclear testing program from the deserts of Algeria to the isolated atolls of French Polynesia, they needed local workers to build wharves, a massive airstrip, concrete blockhouses and the other infrastructure needed for the test site. In his Maginot Line series, he looks at overgrown and decaying Second World War defensive blockhouses. The cemetery first came into being in October 1917 when one of several German blockhouses on the Passchendaele Ridge was captured by the British Army and used as an advanced dressing station. The whole landscape had been militarized, not just along the line of the railway, but in every direction: there had been perhaps 200 or more fortified posts, represented today by lines of eroded trenches, tumbled stone-parapets, and the collapsing walls of improvised blockhouses. The American commander in Archangel had very little contact with his troops in the beginning of the intervention as their force was dispersed to conduct small scale patrols, river operations, and amphibious assaults to secure either World War I style trenches or Boer War era blockhouses.